Every grand journey has its share of mishaps, pitfalls, and bumps along the way. Lost reservations, missed connections, and bad hotels, while frustrating at the time, add to the flavor of the experience. And so it is with my artist’s journey. Each assignment in class takes me to a new destination, and planning the most recent one sounded simple enough: Research one of the Old Masters. Choose a painting that features fabric, and recreate that fabric on canvas. I sat perched next to my painting instructor as she thumbed through an art history book like it was a hotel brochure. With her as my travel agent, I was sure to find the perfect room with an amazing view in a five-star hotel. We perused the paintings, analyzing each one, commenting on why it just wasn’t right for this particular assignment. We gasped in unison when she turned to a page featuring a photograph of Albrecht Durer’s “The Four Apostles.” One of the apostles was draped in an ivory robe. He stood with one hand outstretched and the other hidden in the folds of what seemed like a fine 1000 thread count Egyptian cotton sheet. It was simplistic, realistic beauty. The robe flowed down the apostle’s body, creating striking shadows and highlights as it gathered over the crook of his arm. I could practically feel the soft fabric as I ran my hand across the page. Yes, this was the perfect destination–first class all the way. I smiled as I imagined myself sliding between those sheets after they had been turned down by the skilled housekeeping staff in the Presidential Suite at my five-star resort of choice. “I’m painting that robe,” I proclaimed. I unpacked my art bin, organized my paint, and arranged my palette as I imagined Durer would have. I prepped my canvas, and pulled up the image on my laptop. My planning was impeccable, and I couldn’t wait to start my journey. I began to mix my paint, but the colors were not coming out exactly as they appeared in the original painting. A simple bump in the road. I’ve survived turbulent flights and crazy taxi rides. I would survive this, too. I loaded up my brush with newly mixed paint and set off on my ‘first class’ assignment. As I confidently brushed paint over my canvas, I slowly began to realize something wasn’t right. My proportions were off, my colors weren’t accurate, and my brush strokes looked forced and awkward. This was no ‘first class’ destination, and this wasn’t the room I had booked. I had requested a premium ocean front view–not a parking lot/dumpster view. I felt panic begin to set in. I painted faster. More paint! More paint! The dollops on my palette were starting to dry, and the paint on my canvas was setting faster than I could blend it. I sat back on my chair. It was starting to feel hard and uncomfortable, much like the granitic mattress in my crappy hotel room. I propped my canvas up against a wall across the room. Maybe it would look better at a distance. It didn’t. More paint! More paint! I could feel a sickness brewing in my gut–the kind brought on by the cruel realization that the stunning brochure photos were doctored up with a healthy dose of Photoshop. I tried using a different brush. No–it still wasn’t right. 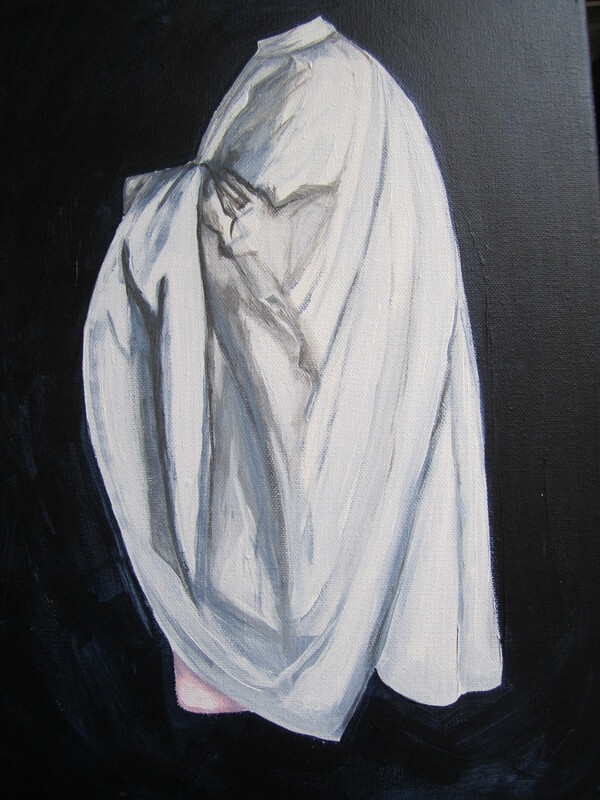 The brochure I looked at featured a beautiful flowing garment–My painting looked more like a ratty old bath robe. Where was my 1000 thread count Egyptian cotton sheet? The monstrosity I had created was a dirty prison sheet. Perhaps I could still save it. More paint! More paint! And then I stopped. I put down my brush and took a long hard look at my work. It was bad. I had to admit to myself that my first attempt at painting fabric had been a dismal failure. I couldn’t save the painting, but I could still save my sanity. I thought I had planned out every step of my journey perfectly, but life doesn’t work that way. I wanted first class, but I got coach. I’ll still arrive at my destination, and I’ll still have amazing experiences on my journey. Along with the five-star moments, I’m going to experience bad service, and lousy hotels with over-starched sheets. Those lamentable experiences might be annoying at the time, but one day, they will make for great stories. And when my ‘fabric’ assignment is hanging on the critique wall next week, I will tell one of those stories. 1000 thread count Egyptian cotton sheet–or dirty prison sheet? There is something incredibly therapeutic about stroking a Number 10 brush loaded with paint across a bare canvas. The brush glides smoothly over the seamless surface, depositing rich swatches of color. The rhythmic motion of the brush can induce an almost magical state of tranquility. Painting forces me to live in the moment. I paint with no distractions. No TV, radio, or iPod–just me, my canvas, brushes, and paint. I am an anxious person by nature, but fear, doubt, and worry over everyday problems vanish as I focus my brushstrokes on color, temperature, and value. I completely lose myself in the process. Time seems to stand still, but in reality, time is passing unnoticed, and I am the one who is finally still. My mind, eyes, hand, and heart all work together toward one common goal. 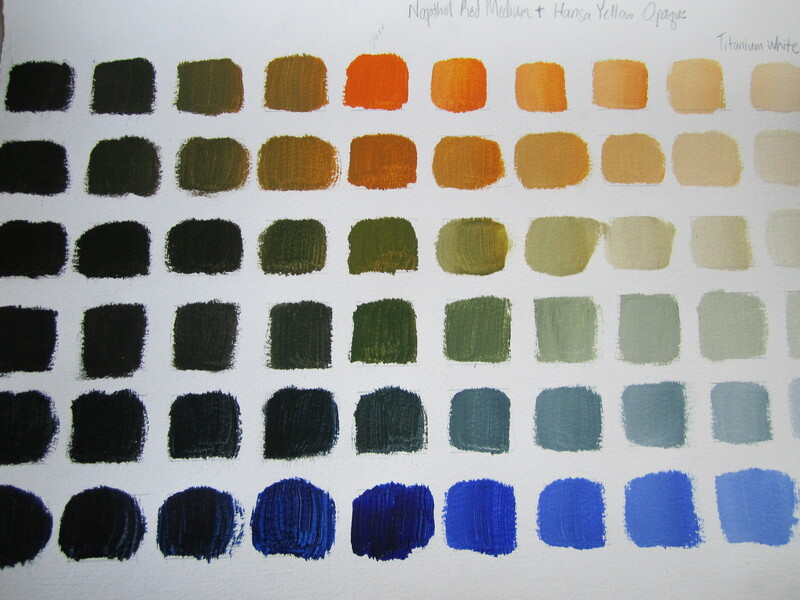 Passion wells up inside me as I see the colors I had envisioned coming to life on my palette. Painting has become my escape, my therapy, my peace. My prescription for sanity is simple: Breathe. Paint. Repeat. An acrylic work-in-progress–This is the second in a series of three from the same still life. I eagerly await the critique wall tomorrow morning! Fall is in the air, and I find myself marveling at her magnificently diverse palette. Summer’s vivid greens, warm reds, and sunny yellows remain, thanks to a parade of endless rain showers, but fall adds her own range of colors specific to her season. The ground is littered with acorns forming a mosaic of deep umbers, raw siennas, and earthy ochres on a shaggy carpet of nature’s most perfect green. While oak trees stay shrouded deep in their olive foliage, the maple trees stand tall, prepared to bare their naked branches to the steely blue skies. Maple leaves slowly lose their brilliant yellow-green hue. Like crayons melting in the sun, each leaf becomes its own unique collage rich with autumnal yellows, oranges, reds, and browns. Fall’s wind gently plucks the works of art and lays them at the maple’s roots like a crumpled blanket to protect against winter’s chill. The hidden magnolia pods turn delicious shades of coral, salmon, and pink before exploding with cherry red seeds that fall to the ground, contrasting sharply with emerald green grass. The crepe myrtle trees are desperate bridesmaids, only a lucky few catching nature’s elaborate bouquets of delicate lavender blossoms. The pine trees harbor their sage leaves knowing winter will not stalk in and rob them of their color. The palm trees mimic fashion’s ombre trend with fronds that fade from forest green to harvest gold. How lucky am I that we have a landscape project coming up in painting class? My color choices will be based on fall’s amazing palette. I can only hope I do her justice. As an art student, I am fascinated by the number of layers that go into an acrylic painting. There are three layers of creamy white gesso, followed by a colored ground, an under painting, and then multiple layers of beautiful color. Some layers are opaque, while others are extremely transparent. Our eyes see the finished piece, but we can only speculate on the hidden layers that lie beneath. All of those unique layers are important, and they come together harmoniously to create the final painting. Change one layer, and you change the work. Our layers are what shape and define us, too. Countless layers accumulate over the years–layers of failure and success, strength and weakness, love and loss. We readily let others see our transparent layers, rich with passionate purples, outgoing oranges, and generous greens, but we bury other more personal layers under thick globs of opaque paint. The sterling qualities shine through, but the burgundy blemishes and indigo insecurities often remain hidden. As we grow more comfortable with someone, we tend to become more transparent, revealing the secret colors of our underlying layers. While we are tempted to conceal some of our most esoteric layers, we have to realize that all of our colors come together to create who we truly are. So the next time you are studying paintings, or people, remember that there is always more to them than meets the eye. 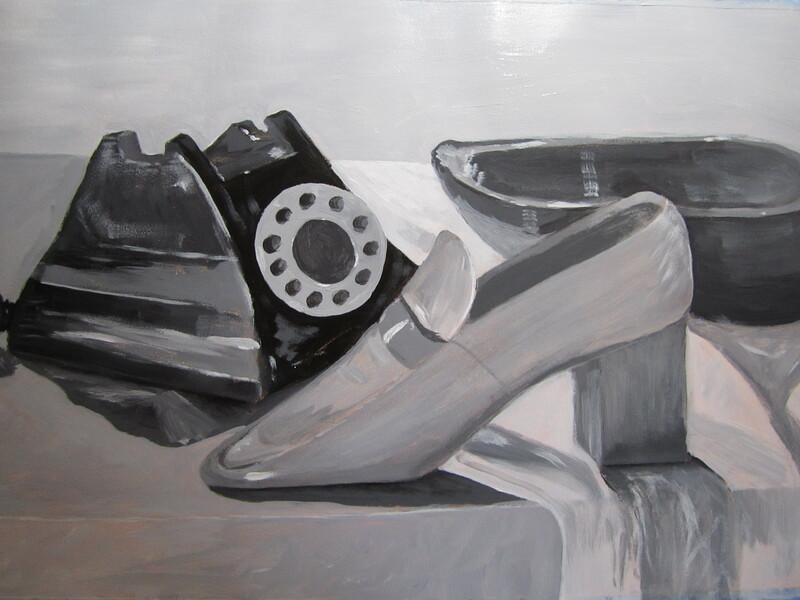 “Old Friends” black and white still life in acrylic–a work in progress–eight layers and counting!! In painting class, we’re studying color theory. But for me, it’s more than just ‘theory’–it’s passion. Like a manic cook in a kitchen full of delicious ingredients, I blend and stir, exploring endless color combinations. I inhale the fragrant diversity as the colors come to life on my palette. I mix up a warm red and blue, but instead of the delectable violet I have envisioned, I create a rather flavorless plum. By simply switching to a cool red and blue, I achieve mouth-watering eggplant purple. Add just a dash of Titanium White, and my eggplant morphs into sweet, floral English lavender. A sprinkle of white can take me from tasty, tangy tangerine to fresh pastel cantaloupe, while a pinch of black transforms bright apple red to the dark burgundy of a fine aged wine. So far, each day in class has been a celebration of the incredible variety in the world of color. I am seeing objects with new-found clarity. That grape isn’t just green, it’s a warm yellow-green with deep indigo and violet shadows. Fruity reds and blues, crisp greens, and starchy whites–I lay out my palette like I’m plating a meal at a five star restaurant. With an abundance of scrumptious colors to choose from, who knows what I’ll cook up next! I can only hope that the critics will give it rave reviews.